The pharmaceutical industry frequently requires stringent sanitation controls. Cell therapy manufacturing has a particularly stringent need for sanitation controls—even by the industry’s already-tight standards. Any kind of foreign substance—be it dust particulates or microbial bacteria—can contaminate a cell therapy product to the point where it actively becomes dangerous to the patient. To ensure the production of therapeutic cells that can meet the critical quality attributes needed in the regenerative medicine industry, the processing equipment that is used to culture and modify the cells needs to be perfectly sterile. 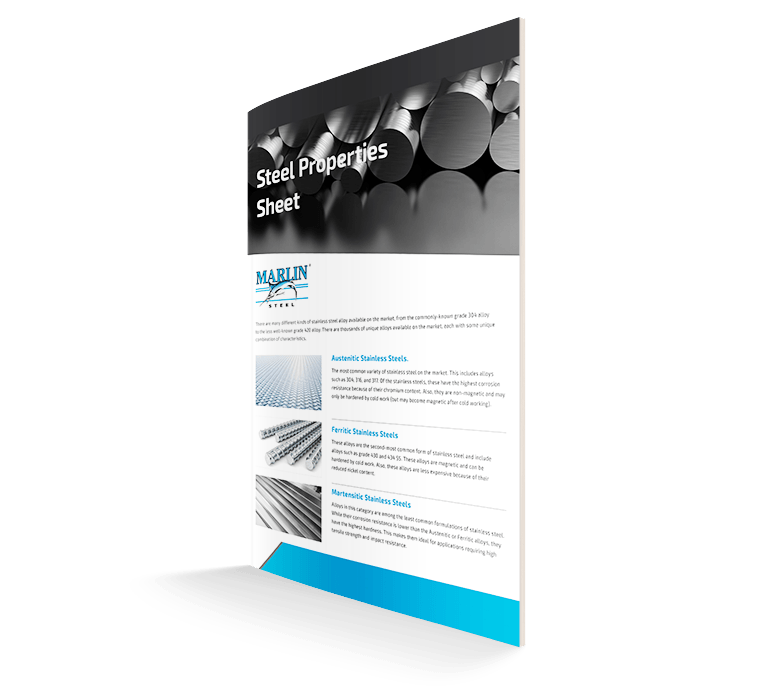 So, when a manufacturer of cell therapy production equipment reached out to Marlin Steel for a custom wire rack to use in their parts washing process, the Marlin team knew they had a major challenge ahead of them. The cleanrooms used in the modification of therapeutic cells have strict sterility controls for a reason. Introducing contaminants from the equipment itself would be disastrous for a sterile environment. Even cell therapy developers who used closed automated systems in the cleanroom need their processing equipment to be perfectly sterile to avoid contamination risks that impact the purity and potency of their cell therapy products. Be able to withstand strong chemicals and high temperatures used to sterilize lab equipment. Provide easy access for pharmaceutical-grade commercial cleaning equipment to clean the held parts. Allow any runoff from the cleaning process to drain easily and completely from the rack after the chemical wash finishes. Keep held parts from falling through the rack during any agitation that may occur. Be easy to load into and remove from the parts washing equipment and the client’s storage solution. For this client, the movement process for the custom wire washing racks was automated—no human hands would be grabbing these racks and adding a risk of contamination. Many of the pharmaceutical manufacturing components the wire rack would process were thin, but wide. However, not all the components were the same shape and size. There were also a few larger storage tank-like assemblies and thicker trays to accommodate in each sanitation load. These parts all had a strict “no scratch” requirement, as flaws in the surface of a part could provide refuge for microbial agents. So, the parts had to be thoroughly separated to prevent part-to-part contact that could cause scratches. To accommodate all the parts that needed sanitation in between cell culture batches, Marlin’s engineering team created a custom wire rack design that incorporated dividers. Each wire rack divider was permanently welded into place. They were spaced to accommodate cell culture tank parts of four different sizes at one time. This would allow the client to process a completely disassembled culture tank all at once instead of having to use four different baskets to process parts individually. 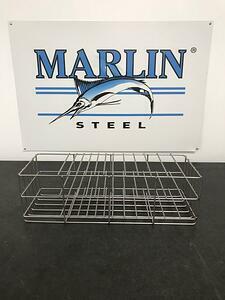 To ensure that the client’s parts cleaning and sterilization system could thoroughly clean the parts in the rack, Marlin’s engineers kept the rack’s design as open as possible. More open space makes it easier for the washing system to reach the parts, for the runoff to drain away, and for the held parts to dry completely. Even the dividers were made using wires, with one wire near the top and middle of the rack for each divider. This would be enough to keep parts from accidentally sliding around during processing while preserving the open design of the basket. The rack was made out of grade 304 stainless steel, to resist the chemicals and temperatures the client needed to use to properly sterilize their equipment between uses. This also had the benefit of making the wire parts washing rack incredibly durable—able to withstand many years of use without the need for replacement to minimize the total cost of ownership for them. Also, as a nonpermeable material, the stainless steel wires used in the rack’s design would not readily absorb or transfer microbial agents from one set of sterilized equipment to the next. Electropolishing the wire racks would further minimize the risk of contamination by eliminating the microscopic flaws that could otherwise appear in the surface of the steel wires. Once the design was completed, it was tested, then sent forward to the manufacturing team for assembly. The actual assembly of the wire racks was completed incredibly fast using factory automation tools. Marlin’s manufacturing robots were able to assemble each rack to incredibly precise tolerances, ensuring that each one would meet the client’s needs precisely—neither being too small nor too large for the client’s parts and parts washing equipment. Need a medical-grade custom wire rack for your own sterilization process? Reach out to the team at Marlin to discuss your unique application and needs today!